Today we going in the sunroom which is the room I'm in most of the time when at home. I always want this room to feel casual and laid back. I really don't think any of my rooms are formal. We are just not formal people. 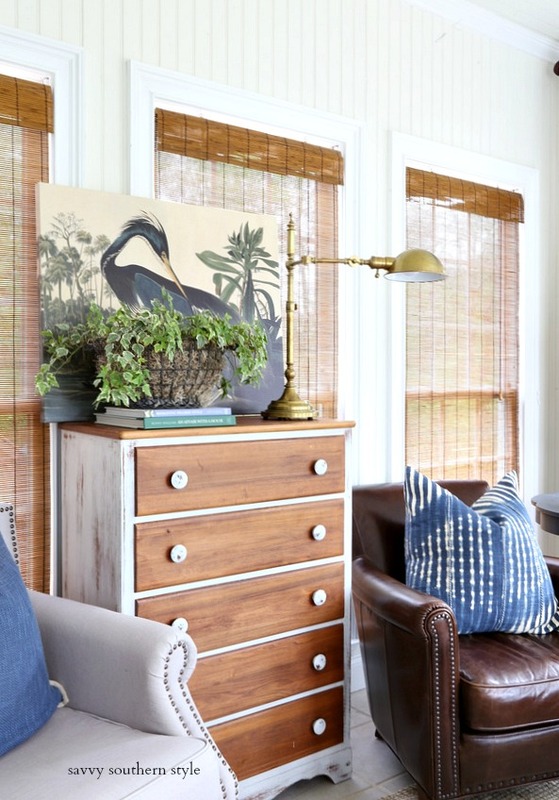 The sunroom sofa, which is a very old Pottery Barn basic sofa, is slipcovered for easy cleaning and the rest of the furniture isn't expensive so it's no big deal if they get messed up. The first thing I always update seasonally or more often are the pillows. I'm sure y'all know I have a thing for pillows. With a neutral background it's easy to change up the accent color by changing those out. I used blue for the winter sunroom and I'm sticking with the blue for now. 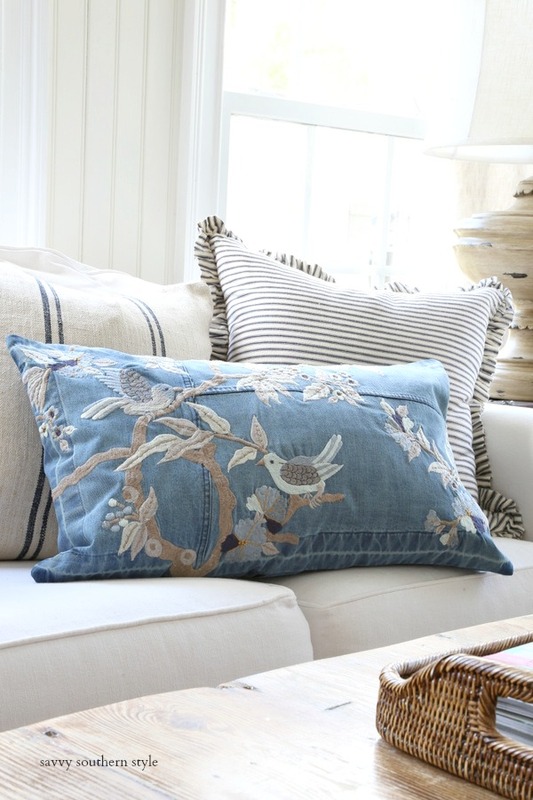 I just swapped out the darker plaid pillows for my grain sack pillows and I bought one new blue pillow with birds on it for some interest and texture and birds make me think of spring. Not the best photo, but my photo bomber, Miss Bailey, says come on in. She loves company. Even though spring means warmer temps we have had several colder days, too and a light weight throw replaces the heavier one I had here for winter. 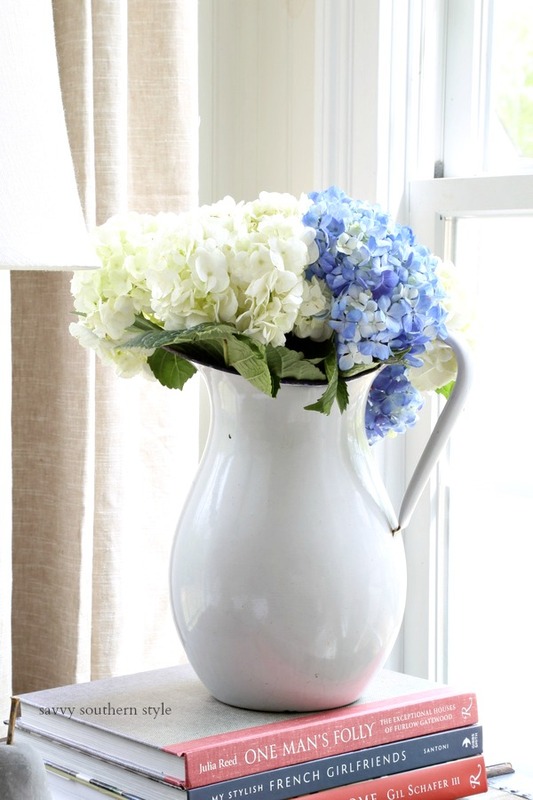 I tucked some blue and white hydrangeas from Trader Joes in my enamelware pitcher. This is the only new pillow. It's made out of denim with the prettiest embroidery. Did you notice the sconces on the wall? These are the Aidan Gray sconces that used to hang beside the mirror over the fireplace in the great room. I wasn't loving them in there and found the perfect spot in here. I ordered this bird art for a different spot in the house, but it didn't work out so I'm glad it works in here. The art was really inexpensive from overstock. For another big pop of color I also picked up these pretty deep pink and white tipped tulips from Trader Joe's and tucked them in this chinoiserie jar. Here you can see the sconces a bit better. 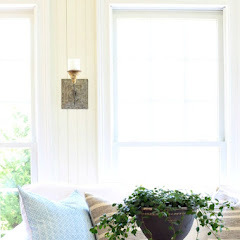 I hope you enjoyed the casual spring sunroom and maybe you found some decorating ideas for your own home. 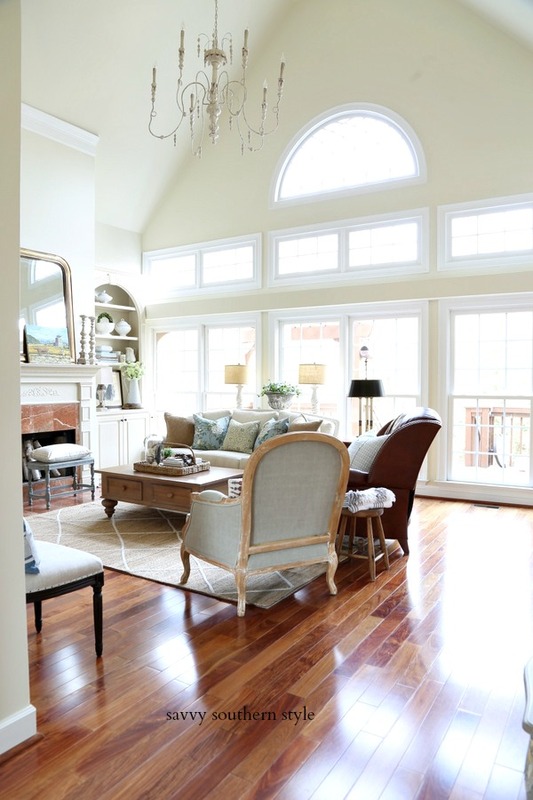 It is easy to see why you spend most of your time in your beautiful sunroom. 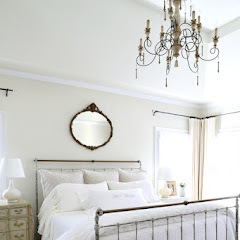 The new pillow is so pretty and I do love the sconces in this space! Happy Monday! 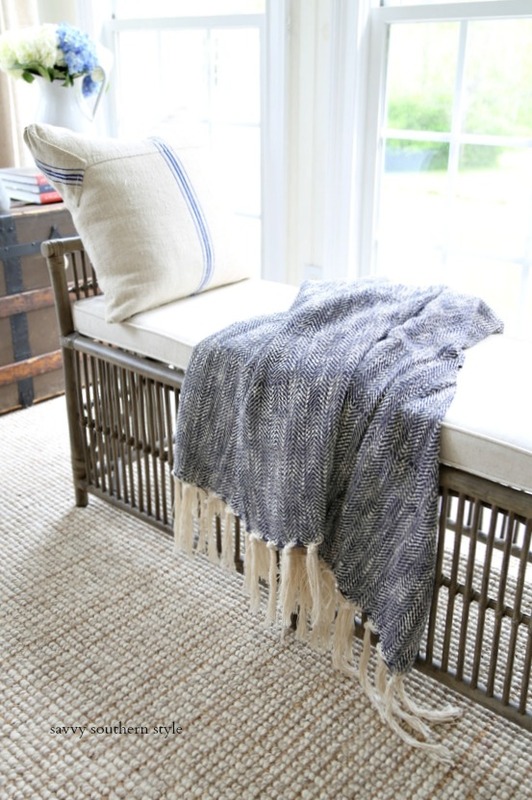 Where did you get your rug for the sunroom? I love your Spring look! 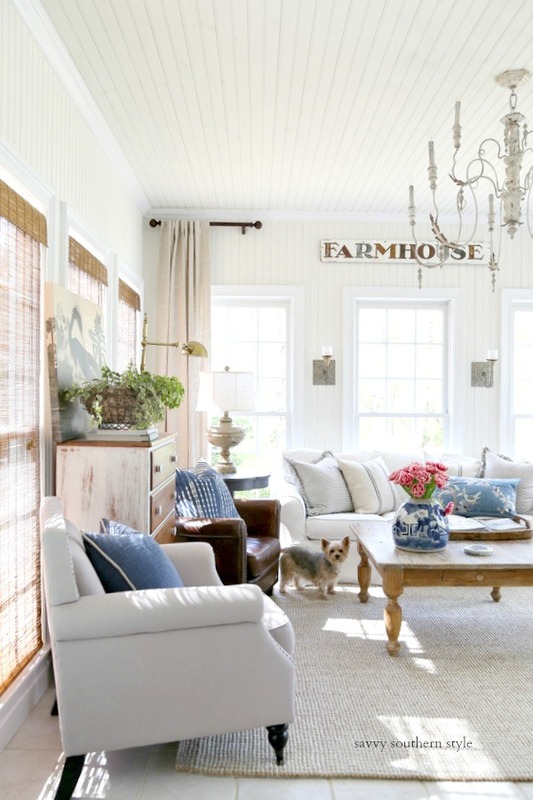 As always, such a beautiful room in every season...love that denim pillow...when I saw them they had to go home with me too....just love the juxtaposition of the casual denim and the elegant embroidery...Looks like Bailey approves of the room refreshed for Spring! Happy Monday! I think this room is a favorite room of mine. What ever you do to it always looks great! Oh Kim I always love your sunroom. How beautiful. I love that denim pillow. So cute. Love seeing little photo bomber Bailey. I bet she loves that room with all the sunshine to take a nice nap. Have a great new week. 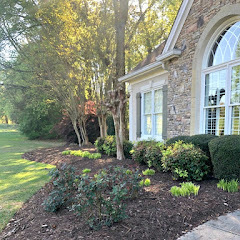 Your home is one of my favorite in IG land! 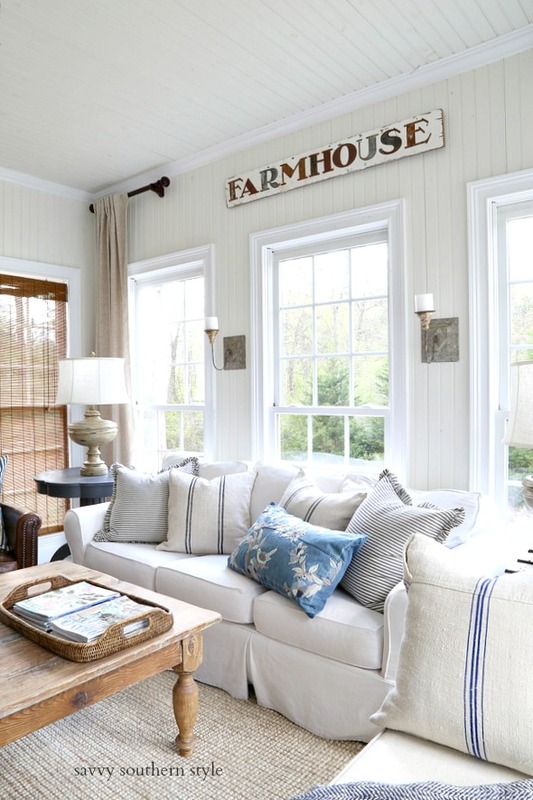 I absolutely love your sunroom all gussied up for spring! Love the elegant casual vibe!! Always love seeing that room (and cute little Bailey!) 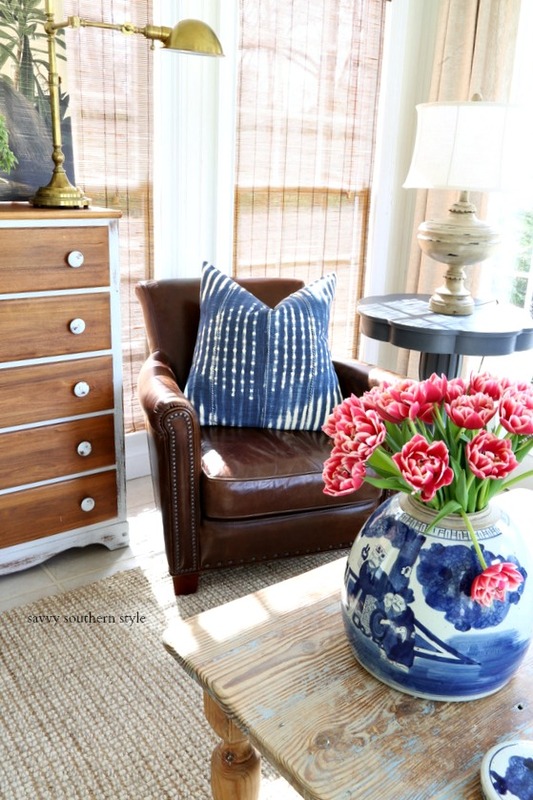 Those tulips are just perfect in the blue and white vase. Enjoy your time in that pretty space. 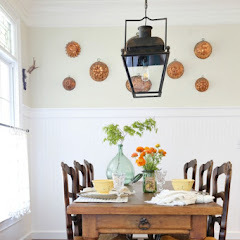 Love those sconces there. Perfect! Hello Kim! I was hoping to see cute little Miss Bailey! 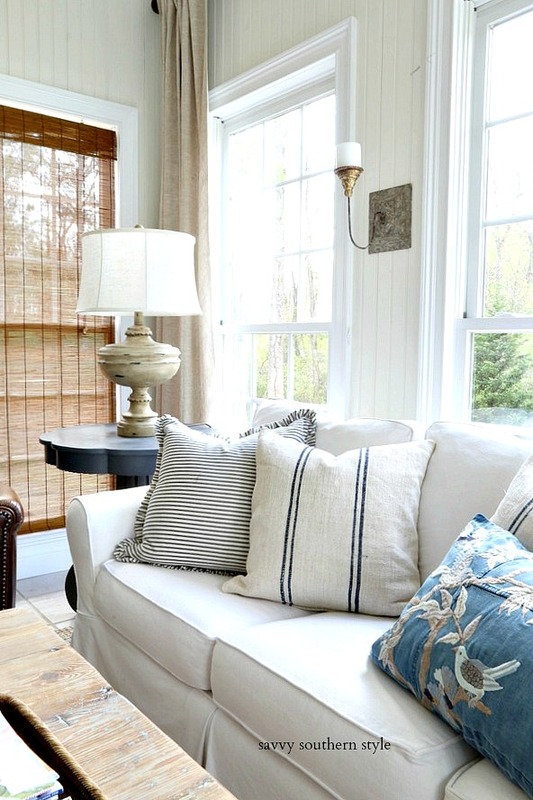 Your sunroom looks so inviting, and I really like your new pillow! 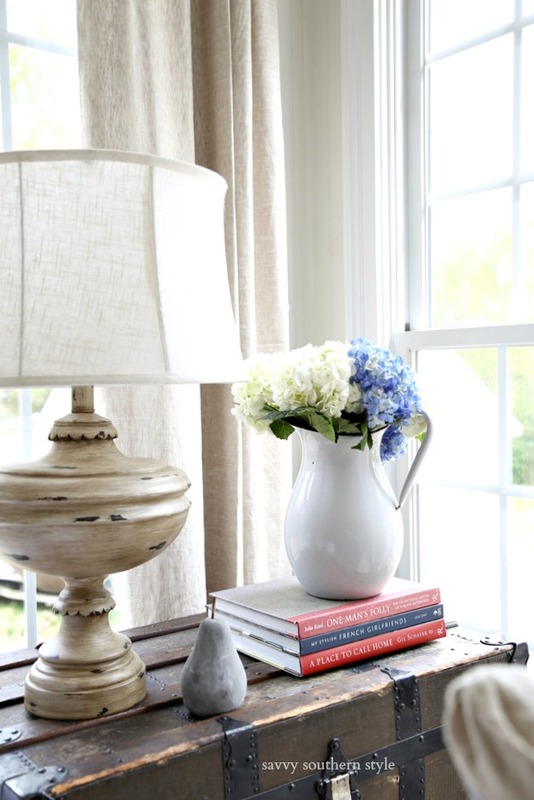 Love your sunroom, the new pillow and all the lovely accents! 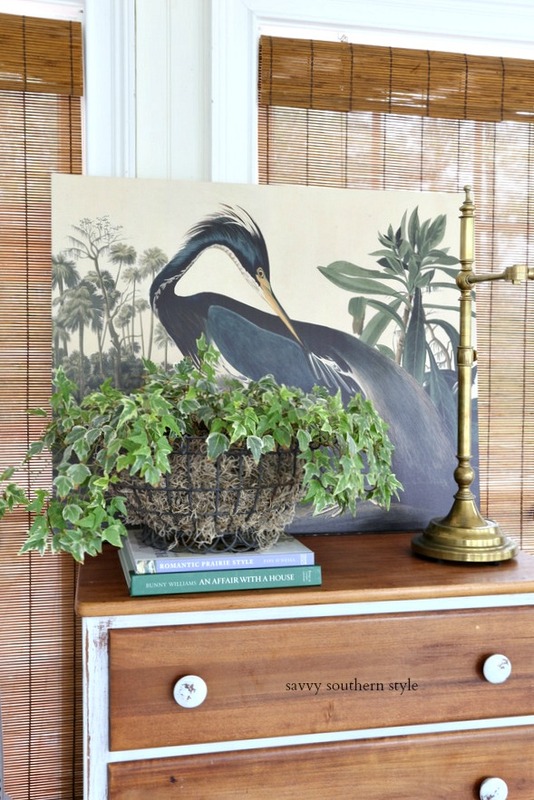 And the blue heron is perfect in there! 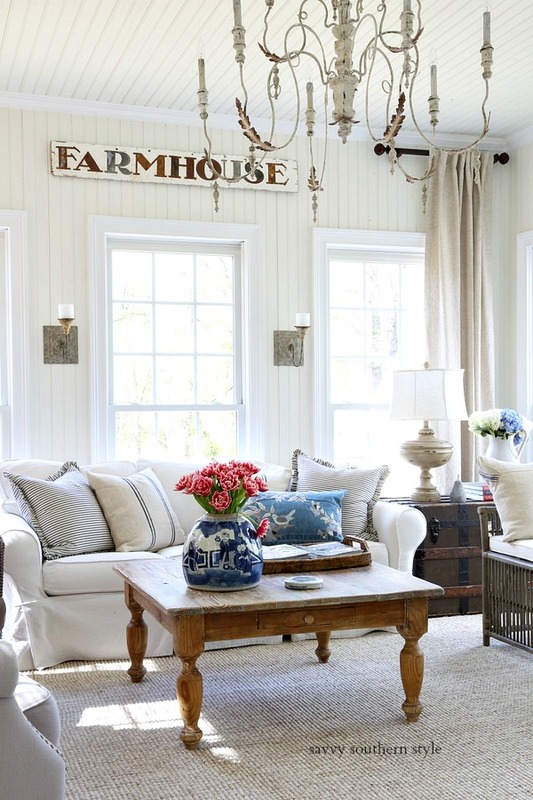 Love your gorgeous sunroom Kim, and the sconces are perfect in there. Ahhh...your Sunroom is my favorite! So pretty!!! Love the blue & white chinoserie jar filled with beautiful tulips for Spring! Did you get that jar at an antique or vintage shop? I have a cheap, inexpensive one I picked up at HomeGoods but would really like a vintage one. I'm a pillow addict as well! 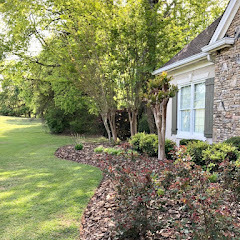 I would love to know how you store your pillows...I struggle with finding an efficient way to store and rotate them seasonally. Please tell me your secret! Looks beautiful Ms. Kim!! I really miss the red/white/blue version, but this one is calm and pretty! Give Bailey a nice back scratch for us! Was hoping someone would ask where you got the denim pillow, so here goes. Where can I find one? It’s gorgeous!